I found out 2 important things yesterday. First, the orphanage where our little boy is coming from: Home of Hope. What a beautiful name! It was started a few years ago in Kigali, by a church in Canada, and is run by the Sisters of Calcutta (Mother Theresa) There are 140 children there. Second: Andy is going there in 4 weeks!! He and 3 others from our church are going on a scouting trip to determine if Home of Hope and this ministry: Africa New Life, http://anlm.org/ both in Kigali, would be good fits for our church to partner with long term. I had to race around yesterday to have his expired passport sent off for expedited renewal. I am beyond excited. Our good friend Natalie is on staff stateside with ANL here in Austin. Andy may get to meet our son! I ran across this description of the orphanage this morning. My mind is again reeling. 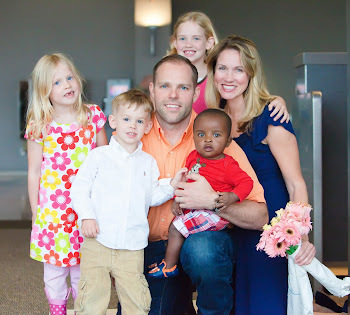 This family, the Greers, adopted from Home of Hope this summer. You should see how their son has blossomed here in his new home. http://milestomyles.blogspot.com/ She and 4 other women have started a nonprofit to help the orphanage, sounds like they really need it!! "Ever since Peter and I left the Home of Hope the last day with our precious Myles Mugisha , we have been haunted by the images of the children we had to walk away from. To finalize our adoption, we were in Rwanda seven days. Three of those days we had to return Myles to the orphanage by 5pm every evening. Peter encouraged me not to enter the orphanage until the final day that we had our son and could take him home. The last day came, and we carried Myles down to the orphanage room where he spent about 5 months of his life, to say "goodbye." As soon as we entered the hallway that led to the different rooms of age-grouped children, I was hit with a smell-mix of dampness, wet diapers, and musty unopened windows. There really is no explaining it. When I entered Myles' room, I saw dark aqua walls, the smell of urine-soaked mattresses, rows and rows of tiny bassinets, each one holding a child, an orphan with a story, a child who needed/s a home. Most of these tiny beds had a string across the top with dangling toys for the babies to look at. The only empty bassinet was the one that had held Myles for those months of waiting. It was the length of his little body, no wonder he still, at 7 months, had no idea how to turn on his side. After spending some time visiting with the babies in the room, and trying to control the depth of anguish I felt for the orphaned children in the room and for the 2-3 care takers who were trying their hardest to feed, clothe, bathe, change, and care for the 35 infants in the room, we left to look into the other rooms of the orphanage. Next we walked into the 12-24 month room. Oddly enough-and I've never experienced anything else like this in my life, but I have NO memory of this room. I believe that it was too hard to see these children and my memory is blocked. The other room that I remember was full of 2-5 year olds (I think) and there were many rows of cribs, 2 children to a crib. I took in the room for a moment: nothing on the walls, not toys to be seen, nothing. Nothing. There is so much more to write, but the end result is how we felt when we left. As we backed out of the Home of Hope driveway, I vividly remember waving to a small group of 2-4 year olds--and remember especially a bright-eyed little girl in a worn yellow dress, smiling and waving to us as we left. While we were so happy to be leaving with Myles, we were leaving many many more. Coming home: I shared with my friends the grief we felt (and many other families feel) for those children left behind. What can we do? How do we start? My friends Christina and Heather, right away, responded with: "we can." A month and a half after we had settled into our new life with our baby Myles, they began talking about the action plan again. "We can do something." Even if it's sending an excersaucer for the infant room, which I got approval for...Myles had very little muscle tone in his legs from non-use.. The sisters at the orphanage and I found a small spot in the infant room where an excersaucer would fit perfectly. My mind went back to the children waving goodbye to us, standing in the dirt outside the Home of Hope, they weren't wearing shoes. "We can" send shoes. We can work together, with the help of others who have same-heart-desires for change." yay for titus/caleb. we are so excited! we are so excited for you, andy, and the kids on the journey. know that we are praying for you and that God brings your new son to you soon! what a lucky little boy to be able to become part of a such a great family! Home of Hope - what a description and love what they are doing! Thanks for sharing all this. Can wait to hold your baby boy!